Yesterday I tried out the queen of all baking - A Cake. I call it a queen because there is something majestic, sweet, luscious and curvy about it ;). And you put on some dressing and it oozes oomph! 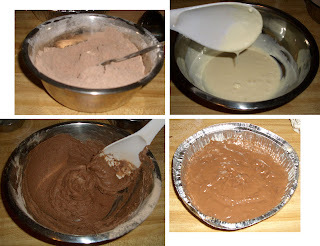 Mix together all the dry ingredients - flour, cocoa powder, baking powder and baking soda. Mix them well in a dry bowl. You could sieve them before mixing to get rid of lumps if any. Keep the butter outside the fridge for some time till it softens. Preheat the oven to 570 deg Farenheit (300 deg Celcius). Put the condensed milk into a large bowl. To this add the butter. Beat the mixture well till the butter blends with the condensed milk. This will need some patience since there should be no lumps and it should be a smooth paste. To this add the dry ingredients mixture spoon by spoon. Stir it into the condensed milk mixture constantly. As and when the mixture becomes too tight add some milk to ease it. Point to be noted - Stir in one direction only. This will make the cake light and fluffy with a lot of air in it. Beat the entire mixture for a good five minutes. Now add the soda into this mixture and mix well lightly. Pour into the greased baking tin. Just jiggle the tin around for the mixture to evenly spread around. Do not use spoon or knife to even it out. Place tin inside oven and bake at 350 deg Farenheit (200 deg celcius) for 7 minutes. Then reduce the temperature of oven to 300 deg Farenheit (150 deg Celcius) and allow it to bake for around 40 minutes. Do check in once in a while to see if the cake is fluffing up. You can also be sure its baked when, if you stick a skewer or knife edge into the cake it comes out clean and no cake stuff sticks to it. It is important to cool the cake on both the top and bottom sides. 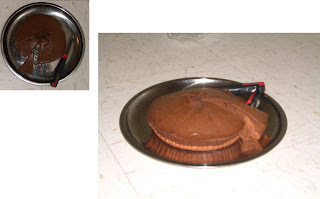 For the air to reach all over evenly you could cool the cake on a wire rack or any stand which has holes in it. nice recipe you've got there. perhaps u may like to try ice cream cake. Try a ganache Siri, all you need is some bittersweet chocolate and heavy cream. You will need 250 gm chocolate and 1 cup cream. Heat the cream to boiling and pour over the chocolate. Mix well, the chocolate should melt into the cream completely. Wait till it cools and use as icing. Thanks for stopping by Jisha. I did try ganache today on some cupcakes. Will post about it soon.